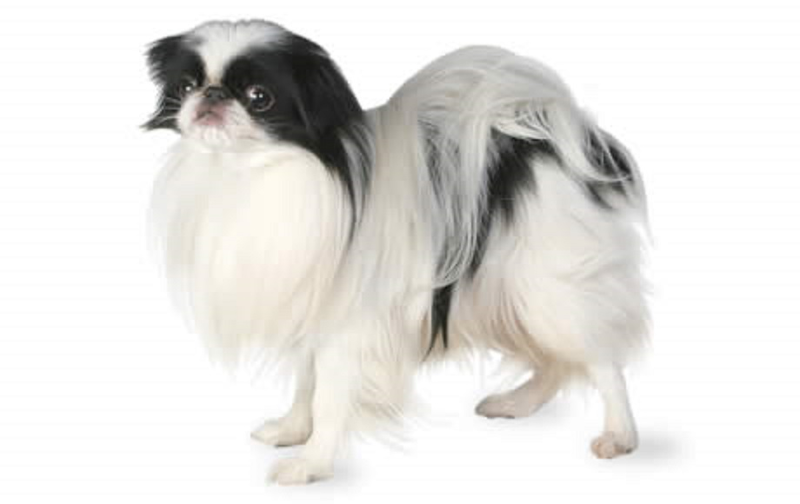 While most believe that the source breed for the Japanese Chin originated in China, the route by which the Chin arrived in Japan is a widely debated topic. One story claims that the dogs were given to the Japanese royalty in 732 AD as gifts from the rulers of Korea. Others maintain that they were given as gifts to the Empress of Japan as early as the middle of the sixth century or by the seventh century. Still others claim that the Chin first arrived in Japan around the year 1000 AD. In Japan, dogs are usually viewed as working or helper animals. The Japanese Chin is unique in that they are owned strictly for companionship. Their distinct appearance and personality eventually captured the hearts of Japanese royalty and resulted in ownership being restricted to those of royal and noble blood. Each noble house bred to their own standards. Because of this, there are many variations of the Japanese Chin including size, coat density, eye set, personality, and body type. Once introduced to the West, a strong desire for Japanese Chin that were ten lbs. or less led to this weight becoming the standard of various kennel clubs around the world. Professor Ludwig von Schulmuth studied canine origins by looking at the skeletal remains of dogs found in human settlements as early as the 8th millennium BC. The professor created a genealogical tree of Tibetan dogs that shows the "Gobi Desert Kitchen Midden Dog", a scavenger, which evolved into the "Small Soft-Coated Drop-Eared Hunting Dog". From this evolved the Tibetan Spaniel, Pekingese, and the Japanese Chin. Another branch coming down from the "Kitchen Midden Dog" gave rise to the Papillon and long-haired Chihuahua and yet another "Kitchen Midden Dog" branch to the pug and Shih Tzu. Though there is some documentation that indicates Portuguese sailors introduced the breed to Europe in the 17th century by presenting them to Catherine of Braganza, Queen Consort to King Charles II of England, there is more credible evidence that the first Japanese Chin were given as gifts by the Emperor of Japan to an American naval officer, Matthew Calbraith Perry, when Perry visited the Orient in 1853 to open trade with the East. Perry was given a total of seven Japanese Chin, but only two survived the passage back to the USA. It is disputed whether Perry gave the two to Franklin Pierce, President of the United States, or to James Stirling, Rear admiral of the Royal Navy, to take to Queen Victoria or his daughter, Caroline Slidell, after returning from Japan.